Professor Jackie Y. Ying was appointed the first Editor-in-Chief of Nano Today in March 2008. 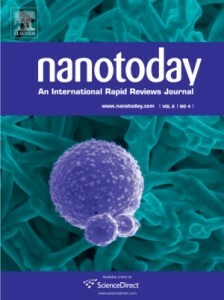 Launched in 2006 as an international review magazine for researchers with interests in all aspects of nanoscience and nanotechnology, Nano Today moved to a traditional journal format in 2009 to provide a peer-reviewed forum for the publication of authoritative review articles, rapid communications, news and opinions to shape and define the frontiers of nanoscience and nanotechnology through their multidisciplinary applications. Nano Today is published six times a year and is covered by the Thomson Reuters Journal Citation Reports for 2010 with an Impact Factor of 11.750, placing it among the top 3 of 66 journals in the ISI Nanoscience and Nanotechnology category. Professor Ying is the Founding Executive Director of the Institute of Bioengineering and Nanotechnology (IBN) in Singapore. She was a professor of chemical engineering at the Massachusetts Institute of Technology (MIT). Her research in nanostructured materials and systems has impacted a diverse range of applications, including catalysis, pharmaceuticals synthesis, ceramics, energy, environment, drug delivery, tissue engineering, bioimaging, biosensing, medical diagnostics and biological devices. A. Being the Editor-in-Chief of Nano Today is an exciting role as this journal has a significant impact on the growing field of nanoscience and nanotechnology. Nano Today is focused on review articles, rapid communications, news and opinions, all of which provide the readership with insights and overviews into the latest advances in nanomaterials and nanodevices. Q. What are your biggest challenges as editor of Nano Today? How do you overcome these challenges and what extra support can Elsevier provide? A. My biggest challenge as editor is to provide our readers with a broad coverage of the latest developments in the design, synthesis and applications of nanomaterials and nanodevices, while keeping the quality of our publications as high as possible. We hope to make a major impact in the field, and reach out broadly to researchers in all parts of the world. A journal editor has to be aware of the most exciting developments and future directions in the field. I often commission leaders in the field to write articles for the journal. Elsevier provides rapid turnaround in the publication process, and this is much appreciated by our authors and readers. Another challenge faced by editors involves ethical issues. For example, besides fraud, authors may send a similar manuscript to multiple journals for publication. They may also inappropriately exclude or include individuals in the authors listing. Elsevier may take a proactive approach by contacting all the listed authors to ensure that the paper had been submitted with their permission. This would help to minimize potential disputes that the editor has to handle. Q. In many areas of research, the growth of paper submissions is outpacing the growth of qualified reviewers and resulting in pressure on the peer review system. What do you think the solution to this problem is and how do you see the peer review process changing in the future? A. Due to the large number of manuscripts submitted, increasingly, the editor has to screen and make an initial assessment on the suitability of the manuscripts for potential publication in the journal. Nano Today only sends manuscripts out for review if they meet our stringent editorial criteria, namely relevance to the scope of the journal, originality and significance in the broad development of the field. Q. We have observed a recent trend that researchers are increasingly accessing journal content online at an article level, i.e. the researcher digests content more frequently on an article basis rather than a journal basis. How do you think this affects the visibility of your journal among authors? A. It will be critical for us to make the journal content available online as much as possible, in particular by providing free access to articles, especially those that are deemed to have a broad impact. This service would be greatly appreciated by the readership, and working together with Elsevier to achieve this would highly enhance the visibility of our journal among our authors and readers. What is your opinion about the 'open access movement’ and how does it affect your journal? A. A journal’s Impact Factor is very important to us as a high Impact Factor would mean a higher likelihood of drawing top articles. Various funding agencies also expect researchers to publish in journals with a high Impact Factor. The pressure is on the editor to pre-select articles that have novelty and a broad impact for further review, and to work with excellent editorial advisory board members and reviewers who are leaders in the field and are committed to the success of the journal. A. We see an increasingly large number of submissions from China, India and the Middle East. It is important for the editor to recognize good research that is being conducted in the developing countries. A leading journal has to serve the interest of authors and readers from all parts of the world by providing comprehensive and top-quality coverage. A. We are delighted that our publisher, Deborah Logan, has given us the opportunity to set up our editorial office in Singapore. Nano Today may be the only leading journal in our field that has its editorial office in Asia. Our knowledge of the growing research enterprise in this region, coupled with our familiarity with the American and European markets, enable the journal to reach out broadly to its readership by engaging all the leading experts in the field, including those from Asia. In addition, we organize the Nano Today Conference, a biennial international meeting on nanostructured materials and devices that showcases the latest research and advances in this multidisciplinary field. This forum features outstanding plenary and invited talks, as well as contributed oral presentations and posters. The inaugural conference held in 2009 in Singapore attracted more than 450 international delegates, while the second conference, which will be held in December 2011 in Hawaii, has received more than 800 abstract submissions from researchers around the world. More details on this conference may be found at www.nanotoday-conference.com.